San Jose, Calif. — San Jose State University will celebrate the historic groundbreaking for its new Interdisciplinary Science Building on Thursday, April 25, at 10 a.m. on the university’s campus in front of Duncan Hall. The first new academic building in 30 years, the Interdisciplinary Science Building construction is the first phase of the university’s new Science Park, part of San Jose State’s commitment to dynamic research and innovation environment in the heart of Silicon Valley. San Jose State’s research endeavors play a critical role in preparing graduate and undergraduate students who work side by side with faculty mentors. With $60 million in annual research expenditures, SJSU is a top-200 school nationally in terms of research spending. The university’s 33,000 students—including approximately 7,600 graduate students —bring an inherent creativity and diversity of thought and experience that can address and solve the most pressing problems facing society today. An artistic rendering shows what the Interdisciplinary Science Building will look like in 2021 when it is completed. The Interdisciplinary Science Building will have eight floors of modern science laboratories and research facilities, as well as collaborative, flexible learning environments. 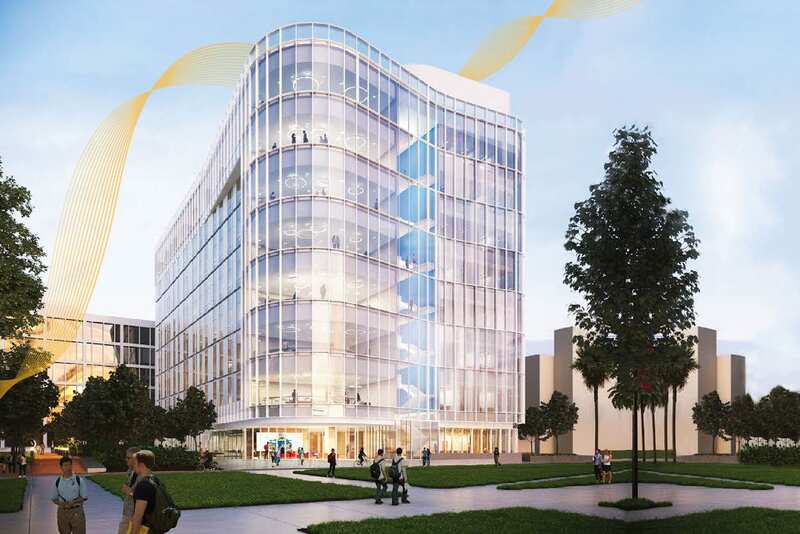 The building will be home to chemistry and biology teaching and research spaces, an interdisciplinary Center for High Performance Computing, data and information science labs, and science administration. Each floor will seamlessly integrate teaching and research. Students who move through these programs will graduate with the theoretical background, hands-on skills and collaboration experience necessary to succeed in industry and advanced studies. Following the ceremonial groundbreaking and program, attendees can see the future of SJSU science firsthand at the College of Science 15th Annual College of Science Student Research Day, located nearby in the Duncan Hall breezeway. More than 100 student-faculty teams will present original work in all science disciplines. In addition, SJSU’s Celebration of Research will take place 3 – 6 p.m. April 23 in the Diaz Compean Student Union Ballroom. Complete ISB groundbreaking event information may be found at sjsu.edu/sciencepark. 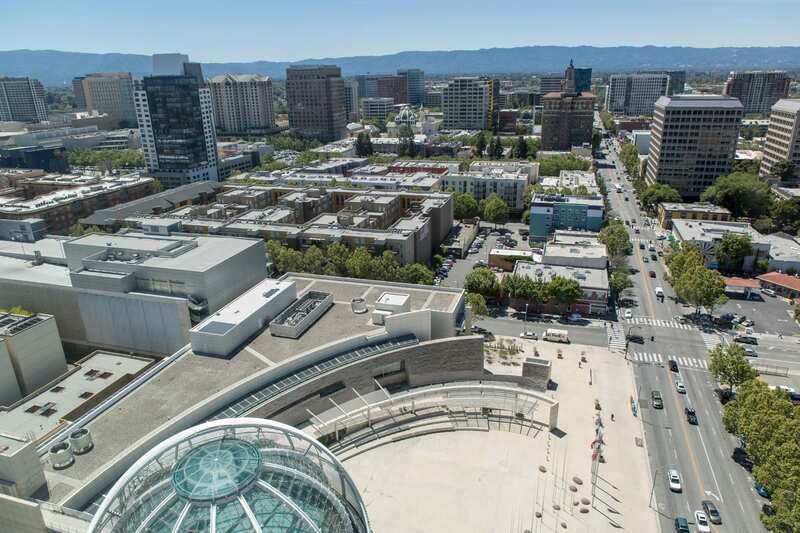 The founding campus of the 23-campus California State University system, San Jose State provides a comprehensive university education, granting bachelor’s, master’s and doctoral degrees in 250 areas of study—offered through its eight colleges. 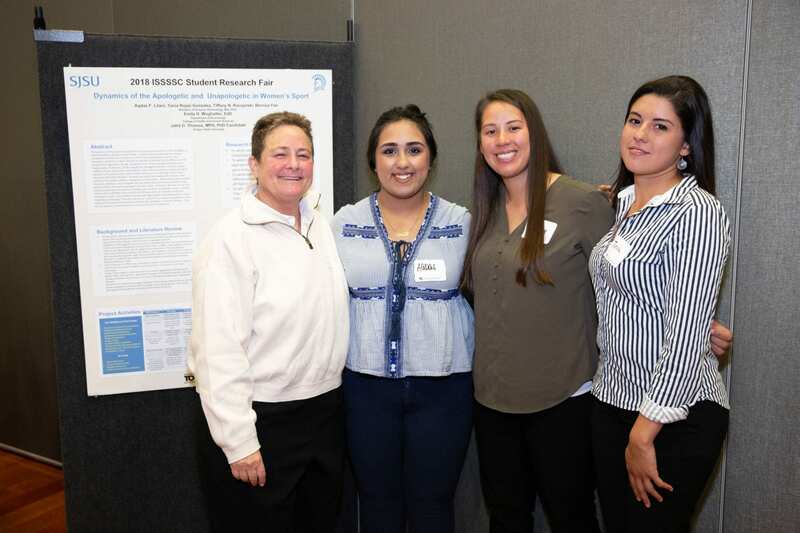 SJSU’s Annual Celebration of Research on April 23, from 3 to 6 p.m. in the Diaz Compean Student Union Ballroom features a full program to celebrate student and faculty research. Students, faculty and staff are invited to watch presentations from 2018-19 Early Career Investigator Award recipients Assistant Professor of meteorology and climate science Minghui Diao and Assistant Professor of Psychology Susan Syncerski. During the event, SJSU Student Research Competition finalists will be recognized. The 12 undergraduate and graduate students will represent SJSU at the CSU Student Research Competition on April 26 and 27 at CSU Fullerton. In addition, 50 Undergraduate-Faculty Research Pairs will share posters of the work they’ve completed in the last year. The event is sponsored by the SJSU Research Foundation, the Office of Research and the Center for Faculty Development. 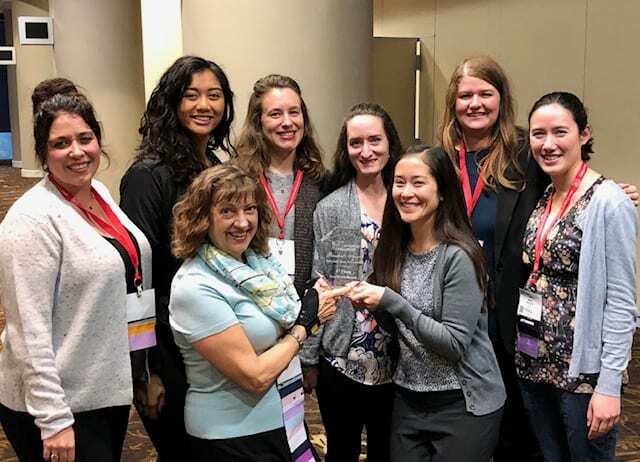 The Undergraduate-Faculty Research Pairs program offers grants to students who are engaged in research, scholarship or creative activities across a broad spectrum of disciplines, including the students who worked with kinesiology Professor Emily Wughalter on understanding how women athletes portray themselves on social media. Wughalter along with doctoral candidate from Oregon State University Jafra Thomas mentored four undergraduate students: Aqdas Lilani, Tiffany Raczynski, Tania Rojas and Bernice Fan. The SJSU students who graduated in spring 2018 reviewed studies from the 1970s that found women athletes to be “apologetic” and studied the way current-day female athletes presented themselves to see if attitudes had shifted. Lilani, ’18 Kinesiology, minor, Nutrition and Food Science, said her focus on the research project was examining the behavior of a women’s rugby team. Thomas, who met Wughalter at the 2017 National Association of Kinesiology in Higher Education, said working on the student-led project offered insight into the portrayal of women in sports that he had not studied in his own coursework, but that he believed it would be helpful in his future teaching and research. “I was pleased to work with these students and to introduce them to the design of research,” Wughalter said. 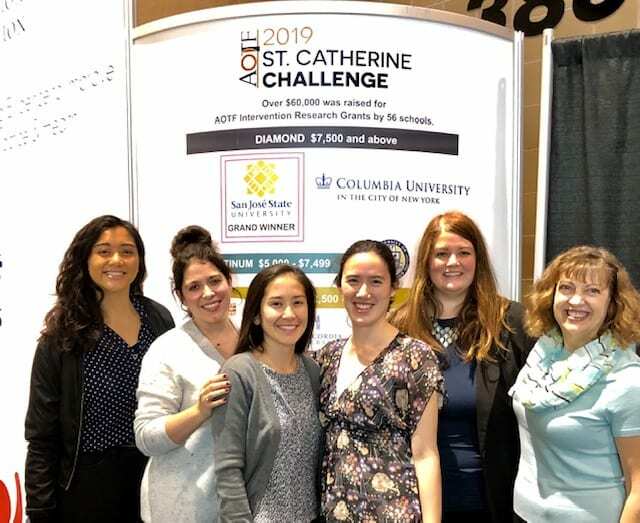 “Their work has already been presented at the Institute for the Study of Sport, Society and Social Change Undergraduate Research Fair in October 2018 and then at a Western Society for Physical Education of College Women national conference. I am extremely proud of these students and their work. Kris McBrian, who will graduate in May 2019, and Elena Fader, who plans to graduate in May 2020, have been working with physics and astronomy Professor Ehsan Khatami. Fader is studying the properties of electrons moving around in an ionic crystal while McBrian has shown that a specific artificial neural network called a restricted Boltzmann machine can be used to simulate how quantum particles behave on a lattice. The experience has helped Fader move outside of her comfort zone and allowed her to network with a guest professor. McBrian said he was so intrigued with running simulations and machine learning he wanted to continue his work beyond a computational physics course project. “As frustrating as it was at first, I’ll never forget the day when the simulation finally started agreeing with theory or the humbling experience of presenting this research at a physics conference,” he said. Victor Leong Gin He, a materials engineering student who will graduate in spring 2020, has been working with Assistant Professor of chemical and materials engineering Professor Dahyun Oh on creating safe Li-ion batteries in both aqueous and solid states. He said he is hoping to make a significant contribution to the electrochemical industry in the years to come. Working with Associate Professor of child and adolescent development Emily Slusser, Sandra Arellano, who will graduate in May 2019, studied how children come to understand that number words refer only to discrete numerosity and not continuous spatial extent. They used three fun games to measure 3-5 year old’s understanding of number and counting as well as their executive functioning and control (a measure of general thinking and intelligence.) Results will be shared at an upcoming Western Psychological Association Conference in Pasadena. 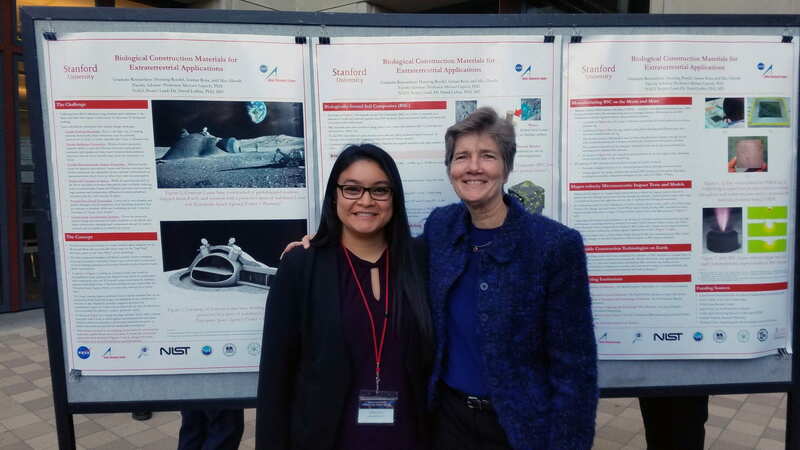 Arellano signed on for the project because she wanted to gain research experience to better understand the field. She is now interested in pursuing a PhD in cognitive science. “I enjoyed observing children’s cognitive abilities during the administered tasks and understanding that the data analysis can be applied to support children’s academics in the long run,” Arellano said. San Jose State University will break ground on its new Interdisciplinary Science Building (ISB) on Thursday, April 25, at 10 a.m. on the university’s campus in front of Duncan Hall, with the 15th Annual College of Science Student Research Fair taking place in the Duncan Hall breezeway following the groundbreaking ceremony. The building will expand opportunities for faculty and student research. Complete groundbreaking event information may be found at sjsu.edu/sciencepark. When Madhumitha Sarveswaran was accepted into the MBA program at the Lucas College and Graduate School of Business, she was interested in finding ways to promote holistic growth in society. She attended the Economic Summit in 2018 when city officials discussed some of the challenges facing the region. 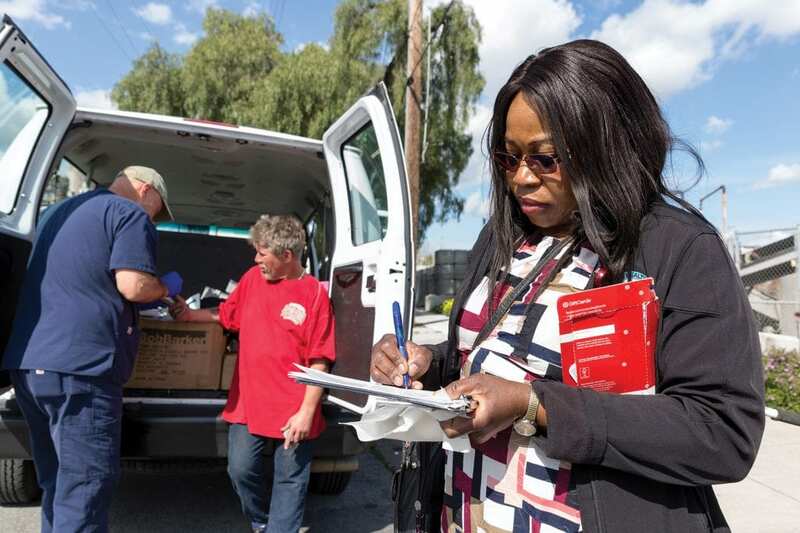 When the Lucas College and Graduate School of Business Dean’s Fellowship program was announced this spring in partnership with the City of San Jose Mayor’s Office, she was excited to apply for it as a chance to work on solutions for some of those issues. 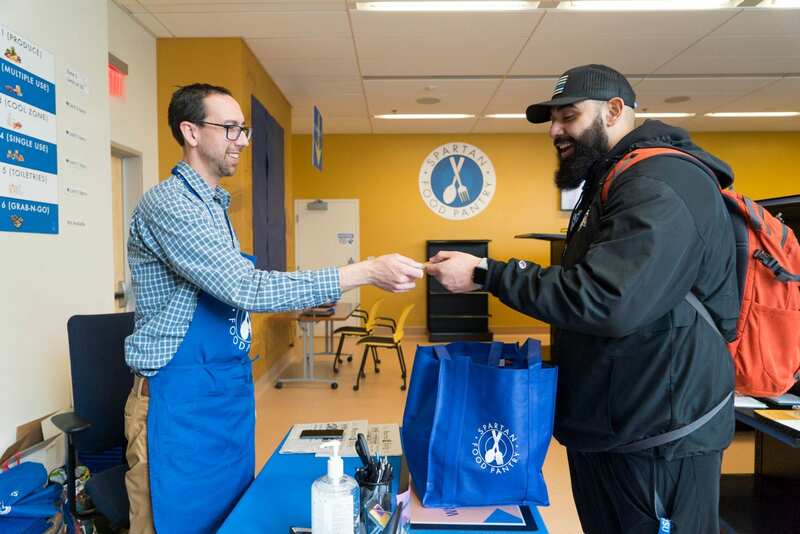 During the pilot semester, the Dean’s Fellowship program partnered with San Jose Public Library (SJPL) Works, ICA Fund Good Jobs, a nonprofit that helps develop small businesses, the city’s Office of Economic Development, and the Mayor’s Office. The students are particularly focused on helping small businesses in East San Jose. For Sarveswaran, who will complete her MBA in May 2019, and Lori Okamoto, who will complete her MBA in August 2019, the fellowship was that opportunity to explore ideas with real-world conditions. Sarveswaran said she has appreciated the opportunity to network with professionals from city departments, nonprofits and businesses. Through the fellowship the students have been researching small business community needs through secondary and primary research that includes data review and analysis as well as direct outreach. As an international student from India, Sarveswaran said she would encourage other international students to apply for the fellowship in the future. After completing her MBA this spring, she plans to complete a course on project management and will take a job in that field. The fellowship has offered her plenty of experience in that arena, from time tracking, assigning tasks and managing deliverables, as well as the market research and survey work. 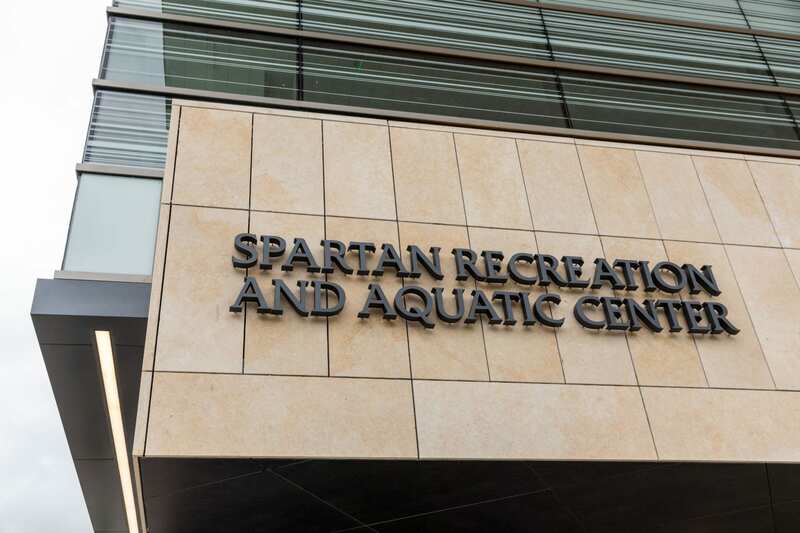 SAN JOSE, CA – San Jose State University will hold a grand opening ceremony for the new Spartan Recreation and Aquatic Center (SRAC), a facility that provides new modern recreation facilities and services for students and the entire university community, on Thursday, April 18. San Jose State President Mary Papazian will be in attendance to welcome the campus community and share remarks. Students can begin queuing east on San Carlos Street at 11:30 a.m. for the ribbon cutting, which will begin at noon. The first 4,000 students will receive an SRAC beach towel, cake, and light food, and will be able to enter a drawing for giveaways. The facility, said Faas, features something for every student. 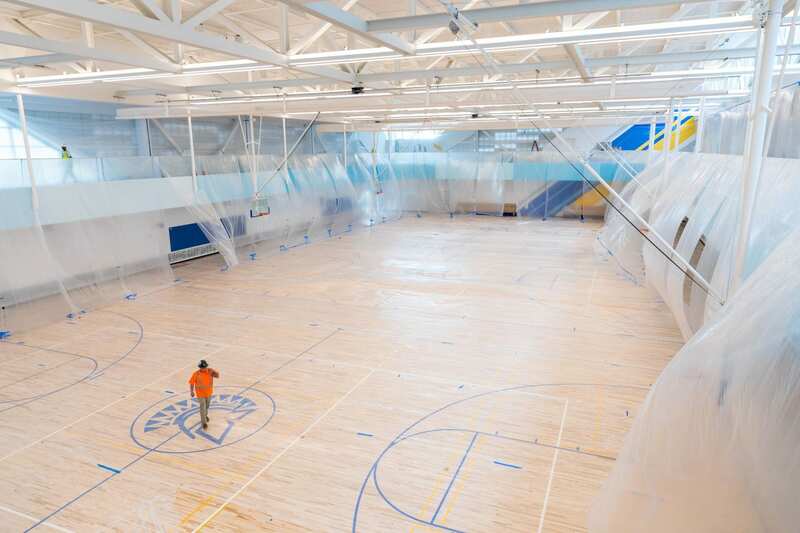 There will be fitness classes, various sporting and recreation clubs, rock-climbing, pick-up game availability and other activities for all skill and fitness levels. Gensler, a world-renowned architecture firm, designed the new SRAC, with Hunt Construction serving as the general contractor. 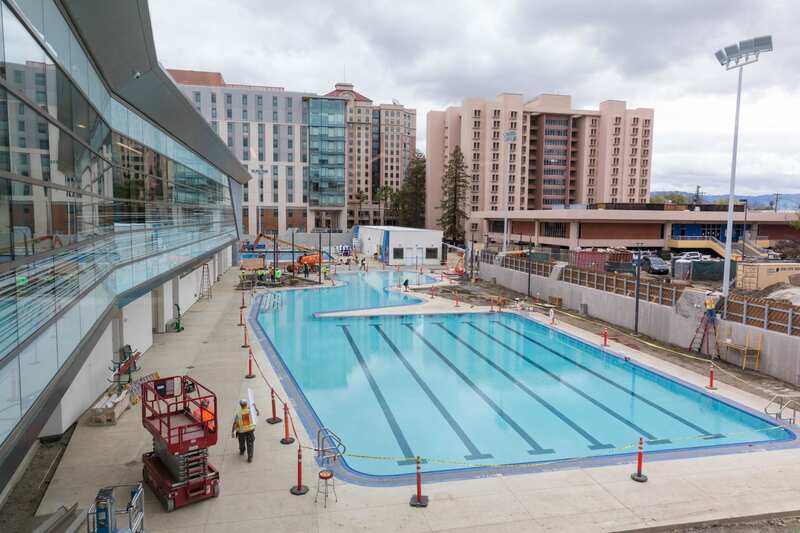 The 128,000-square-foot structure sits at the site that previously housed an aquatic center and two residence halls. The $130 million project is funded through a non-tuition Student Union mandatory student fee, which covers the bond for construction, the annual operational costs, and any future major or minor maintenance repairs. In 2006, the university presented two fees, a Student Union mandatory student fee that funded the Student Union renovation and expansion (completed in 2016) and also funded the new SRAC project, and a Health Center fee that funded the Student Wellness Center (completed in 2015). SRAC is free to all enrolled SJSU students. Paid memberships are available to faculty, staff, alumni and community members. Visit the Spartan Recreation website for more information. Bud Winter Field Track at 10th and Alma. 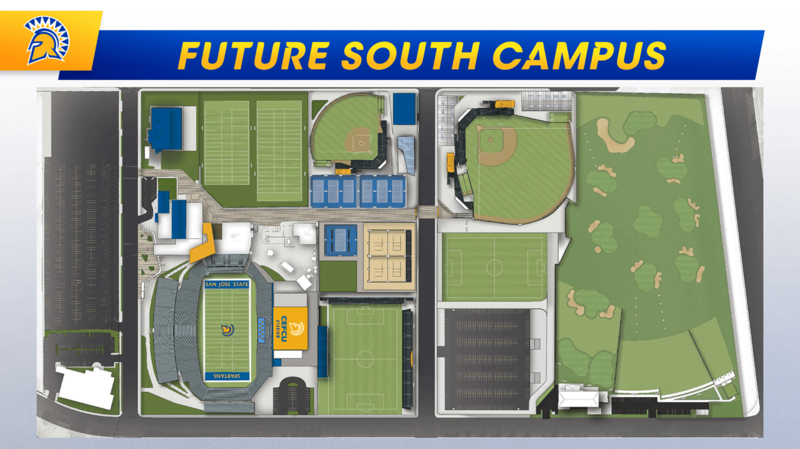 San Jose State University will break ground in June on a project to build an intramural recreation field, walking path and multi-level parking garage at the university’s Bud Winter Field. San Jose State plans to build a special tribute at the site to honor those known as the “Speed City” athletes and their legendary track and field coach, Bud Winter. The new recreational field will be used by thousands of San Jose State students. This field will be home to SJSU clubs, intramurals, ROTC practice, kinesiology classes, marching band practice, Greek life competition and other activities. A walking path around it will be open to the community members who currently use the Bud Winter Field track at South 10th Street and East Alma Avenue, which will be removed. The university recently informed its track and field athletes that it cannot proceed with a previously announced plan to build a new track at the site, where some of its world-class Speed City athletes once trained. “After requesting proposals for construction of a track atop a planned multi-level parking structure, university administrators learned the track would cost up to $20 million more than originally anticipated, due to building-code changes,” said Charlie Faas, the university’s vice president of administration and finance. After learning of the higher-than-expected track cost, the university considered whether to build a replacement track at the university’s park-and-ride lot in the area—but the space was insufficient. San Jose State’s Student Union, Inc. gave a $3 million donation: $2.5 million for track and field and $500,000 for a new softball field. When administrators learned that a track atop the proposed parking garage would cost far more than expected, the Student Union, Inc. donation was reallocated to be used for the intramural field, which will benefit a wide variety of students, Faas said. 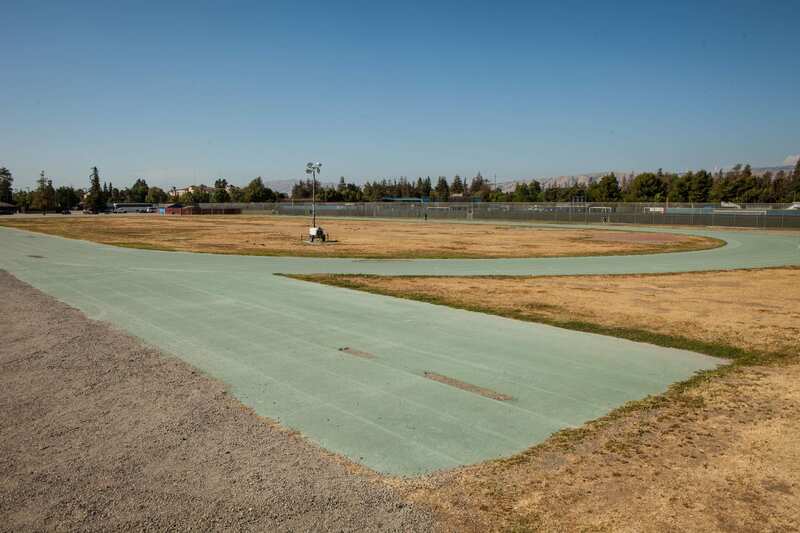 As the 51-year-old Bud Winter Field facilities have long fallen into disrepair, the men’s and women’s track teams have been practicing at San Jose City College for some time. “Our current goal is to secure a long-term agreement there or at another facility to ensure our track and field teams have a high-quality venue at which to practice and train for competition,” said Tuite. 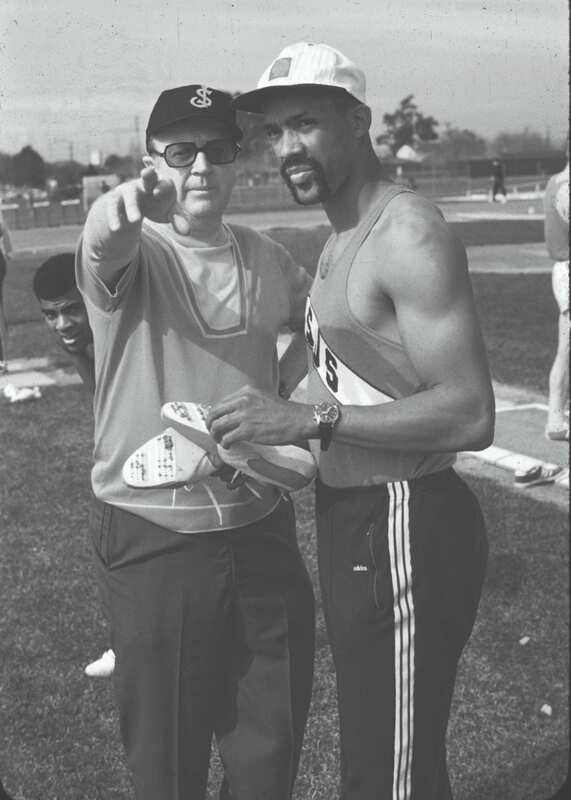 Coach Bud Winter (left) and legendary John Carlos on the Bud Winter Field Track at 10th and Alma. Before the Bud Winter Field was built in the late 1960s at South 10th Street and East Alma Avenue, Winter trained many world-class caliber athletes at another track, located nearby at South 7th and East Humboldt streets on the South Campus. 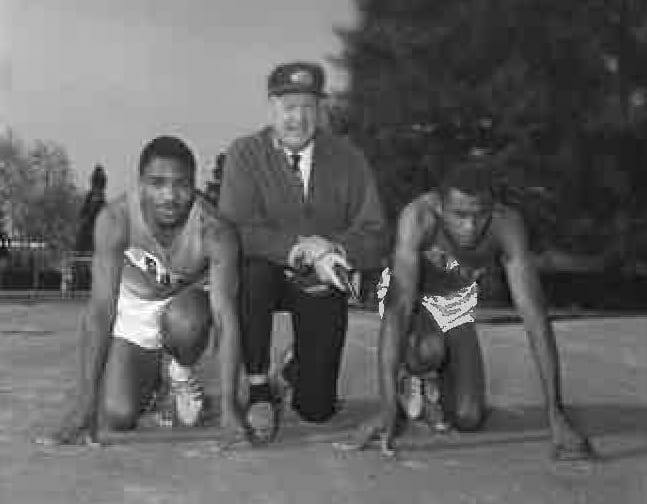 “San Jose State’s track and field legacy gained a sprinter’s momentum when Bud Winter was named head coach in 1941. For three decades, he attracted record-setting athletes that were ranked among the best in the world. These athletes made Speed City famous competing at the old 7th Street track, later training and racing at Bud Winter Field on 10th Street and around the world for nearly 40 years,” said Lawrence Fan, the university’s athletics media relations director. Years later, the Koret Athletic Training Center was opened in 2001 over a portion of the old 7th Street track, for use by San Jose State’s intercollegiate athletics program. That building also now houses the Jeff Garcia Hall of Champions, which honors all those inducted into San Jose State’s Sports Hall of Fame—including track and field stars. The Simpkins Stadium Center also now covers a portion of the old 7th Street track, Fan said. Bob Griffin (left), Coach Bud Winter, and Olympic gold medalist Tommie Smith at Spartan Track previously located at the corner of 7th and Humboldt. Some Speed City athletes who qualified for the U.S. Olympic Team trained at Bud Winter Field in preparation for the 1968 Mexico City Summer Olympics. Those Games are remembered in part for San Jose State track stars Tommie Smith, a gold medalist in the 200-meter dash, and John Carlos, a bronze medalist in the same event. They raised their fists atop the medals stand in Mexico City to protest racial injustice for African-Americans. Today, the iconic sculpture of Smith and Carlos—with fists raised—represents a silent stand for human rights and is prominently located on the university’s main campus to honor their courage. Their athletics feats and others associated with the Speed City era are on display at the Jeff Garcia Hall of Champions inside the Koret Athletic Training Center and at the SJSU Special Collections and Archives in the Dr. Martin Luther King, Jr. Library. In addition to the Sports Hall of Fame displays located on South Campus and the sculpture of Tommie Smith and John Carlos on the main campus, San Jose State will continue to honor the Speed City athletes’ legacy by building a special tribute at the site where Bud Winter Field currently stands. The university’s track and field stars have demonstrated athletic excellence, and also made a stand for human and racial equality on the world stage. San Jose State has approximately 20,000 commuters who drive to campus each day. With only 5,121 parking spots in three on-campus parking garages and approximately 1,200 parking spots on campus surface lots, there is a real and existing parking challenge. The proposed multi-level parking garage will provide 1,530 new parking spaces which will offer much-needed parking for students, faculty and staff. In addition, the new structure will raise money from parking fees paid by fans of the San Jose Giants minor league baseball team and by those who use the Solar4America Ice venue, also known as “Sharks Ice,” near the university’s south campus, Faas said. Pending completion of the California Environmental Quality Act (CEQA) study and final approval, construction of this new facility is scheduled to begin in June 2019 and is expected to open in the fall of 2020. SJSU is accepting applicants for its solo doctor of nursing practice program to start this fall. Here, 2014 DNP graduate Mercy Egbujor works with patients in the field. San Jose State’s Valley Foundation School of Nursing’s Doctor of Nursing Practice program has evolved into a program offered solely by SJSU, and is now recruiting applicants for fall 2019. The new program will allow a more local, Silicon Valley approach to curriculum and deliverables. “Now that the program is localized to SJSU, there is greater potential for partnership with the state of the art medical centers and healthcare systems in Silicon Valley to work collaboratively toward promoting a culture of excellence in evidence-based practice and improved healthcare quality and safety for residents of Santa Clara County and Northern California,” said Michelle DeCroux Hampton, RN, PhD, MS and DNP program co-coordinator with Ruth Rosenblum. Formerly part of the California State University Northern California Consortium of Nursing Practice program offered jointly with CSU Fresno, the inaugural cohort presented their oral defenses in 2014, with a total of five cohorts completing the program to date, with graduates going onto to do influential work across the region and state. Mercy Egjubor, a graduate of the inaugural class, created a backpack medical unit. Many of the graduates have gone on to teach in nursing programs across the state. Sharon Castellanos, another 2014 graduate created a nonprofit to raise awareness of organ and tissue donation in Hispanic neighborhoods. Yet another graduate, Christopher Patty led a medication safety program for the clinics in which he worked. The SJSU DNP program is a focused program, taking place over five semesters (or 23 months). Almost exclusively proctored online, through the online learning platform Canvas, the course curriculum is designed to mesh with the busy lives of professionally active, working nurses. Once a semester, before formal classes begin, there is an on-campus meeting of all students in the program, encouraging networking and providing vital information for the semester to come. Over the five-semester program, practicum experience will be recorded in order to meet the regulatory requirement of 1,000 post-Baccalaureate clinical hours. The application deadline for fall 2019 is May 15, and Interested candidates should apply concurrently through www.nursingcas.org and https://www2.calstate.edu/apply in order to be considered. 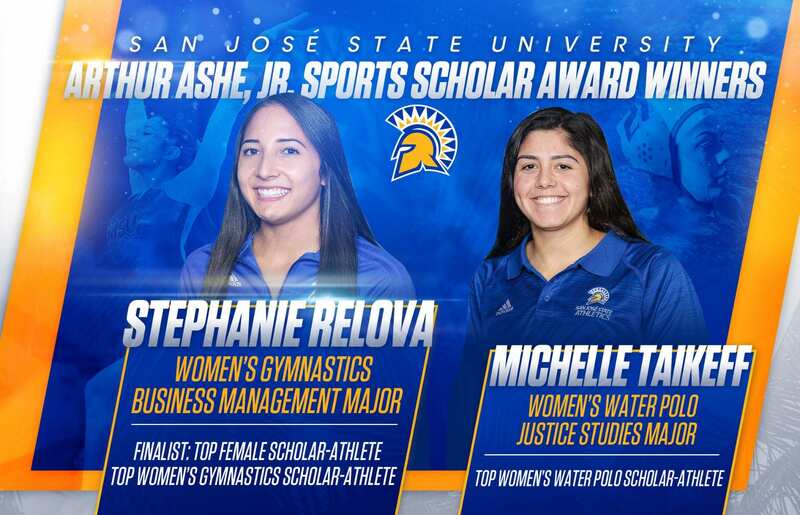 San Jose State University seniors Stephanie Relova and Michelle Taikeff were named this year’s Arthur Ashe, Jr., Sports Scholars national award winners in the sports of women’s gymnastics and women’s water polo, respectively, in the April 4 edition of Diverse Issues in Higher Education. Relova, from San Ramon Valley High in Danville, Calif., was named the publication’s #1 female gymnast scholar-athlete, a national semifinalist among the 20 female sports categories and the overall national runner-up for the 2019 Arthur Ashe Jr., Sports Scholar female scholar-athlete of color. She is a three-time All-Mountain Pacific Sports Federation (MPSF) award-winning gymnast. The San Jose State University President’s Scholar award winner is a business management major with conference and national academic honors. 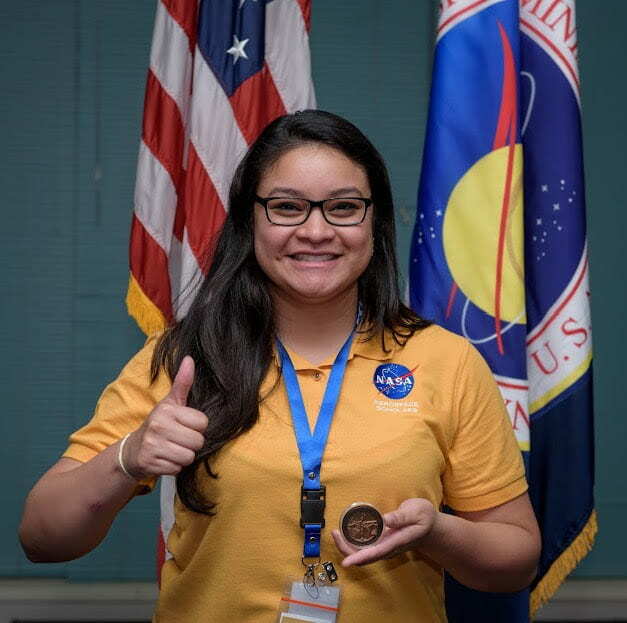 Her volunteer activities include teaching youngsters how to compete at the San Jose Tech Museum of Innovation, visiting local elementary schools and participating in campus clothing and food drives. Taikeff, from Pioneer High in San Jose, Calif., was this year’s women’s water polo national scholar-athlete of color. Like Relova, Taikeff is a team captain, a San Jose State University President’s Scholar and has received conference and national academic honors. This year’s San Jose State University Student-Athlete Advisory Council (SAAC) elected secretary is in her second year of service to her fellow student-athletes. In the community, Taikeff served an internship as a legal aid preparing court petitions for low-income citizens to gain access to the legal system. Named after the late tennis great Arthur Ashe, Jr. (1943-1993), an African-American men’s Wimbledon and U.S. Open tennis champion who devoted much of his adult life to identifying and providing solutions to end discrimination in all facets of life, the awards program now is in its 27th year. Student-athletes of color possessing a 3.50 cumulative grade-point average, have sophomore standing or higher, are contributing members to their team and are active in community activities are eligible to be nominated. In the last four years, San Jose State student-athletes of color have received 102 Arthur Ashe, Jr., Sports Scholar awards from Diverse Issues in High Education and have been named the top scholar-athlete of color in the sports of football (Tim Crawley in 2017), women’s gymnastics and women’s water polo. The university is proud of the accomplishments of its more than 280,000 alumni, 60 percent of whom live and work in the Bay Area. San Jose State will live stream President Mary Papazian’s inaugural State of the University address and formal announcement of SJSU’s strategic plan noon to 1 p.m. Monday, April 8, 2019. Visit the relaunched strategic plan website to learn more. 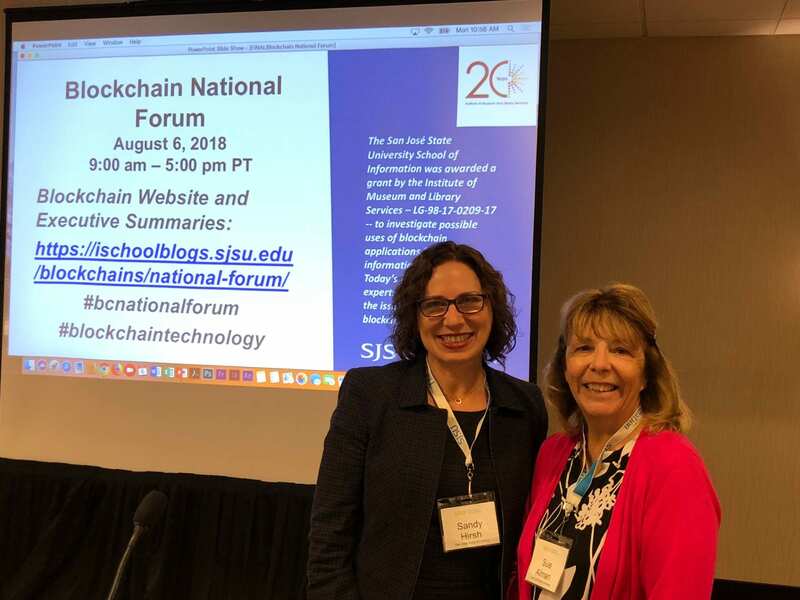 Dr. Sandy Hirsh, left, and Dr. Sue Alman, presented their research at the National Blockchain Forum in August 2018. Starting in 2017, Hirsh and Alman recognized an expanding literature about how blockchain technology was on the brink of revolutionizing the public and private sectors, including mentions of the emerging tool at conferences, in books, white papers, and more. 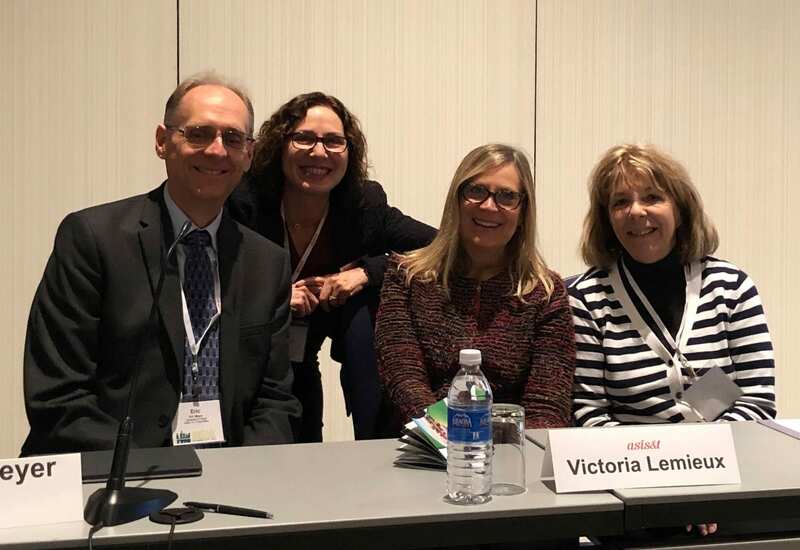 SJSU researchers Dr. Sandy Hirsh, second from the left, and Dr. Sue Alman, far right, served on a panel with colleagues Eric Meyer, of the University of Texas at Austin, and Vicki Lemieux, University of British Columbia, at the Association for Information Science and Technology Conference in Vancouver, Canada. The Institute of Museum and Library Services (IMLS) awarded the pair a $100,000 grant to investigate applications of blockchain technology in libraries. As part of the project, they created a dedicated website and blog; organized a virtual conference as part of the Library 2.0 Conference series; hosted a Blockchain National Forum; sponsored a Massive Open Online Course (MOOC) entitled “Blockchain & Decentralization for the Information Industries”; presented findings at numerous national and international professional conferences and webinars; and plan to publish a book this spring. “While there are many individuals within the information professions who do have a technical understanding of blockchain, we quickly found that information professionals in general do not have a clear understanding about what blockchain is and what the possibilities are and they need training to help build that knowledge base,” the pair said. They also discovered a wide range of ideas about possible applications of the technology in libraries, and realized it would be helpful to provide concrete examples of applications and opportunity to pilot some applications in a sandbox environment in order to understand what the next steps should be. As they wrap up the grant with IMLS, Hirsh and Alman hope to pursue funding to continue with pilot blockchain projects for libraries. One idea they have discussed is developing an international interlibrary loan pilot for the International Federation of Library Associations and Institution’s voucher system. Other ideas include creating a universal library card in public libraries as some library systems require a mailing address or limit access to a hometown or local library system; issuing credentials to library users who achieve certain skills; and determining the accuracy and consistency of archival records. “We are currently working to develop one of more of these ideas into more robust proposals and to seek funding to build them out so that our field can have a good test case for blockchain technology,” they said. Participants at the National Blockchain Forum in August 2018. The researchers continue to share their findings throughout this spring, including at a University Scholar Series talk by Hirsh on May 8 at noon in the Dr. Martin Luther King Jr. Library Room 225/229. “The initiatives of the iSchool faculty are trend-setting in multiple areas, and our international reputation for educational and research excellence is widening,” they said. Blockchain: Transforming the Technological Future. (2019, June). Panel to be presented at the 2019 American Library Association Conference. Washington, DC. Blockchain: The New Technology and Its Application for Libraries. (2019, June). Invited speaker at the 2019 Special Libraries Association Conference, Cleveland, OH. Blockchain Technology in Education. (2019, June). Panel to be presented at the SIAA Ed Tech Industry Conference & CODiE Awards. San Francisco, CA. Blockchain: Transformative Applications for Libraries and Education. (2019, May). Keynote to be presented at the San Jose State University’s 2019 University Scholar Series, San Jose, CA. Blockchain & Opportunities for Libraries. (2019, March). 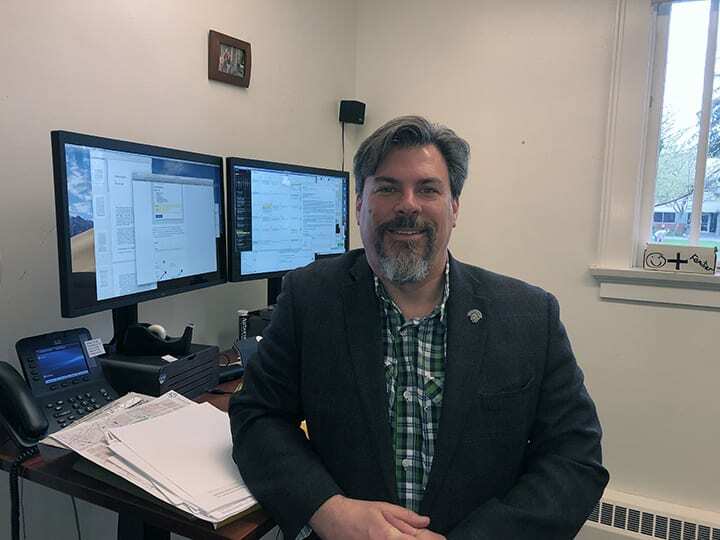 Panel to be presented at the 2019 Computers in Libraries conference. Washington, DC. Blockchain Possibilities: Investigation Findings. (2019, March). Paper presented at the Special Libraries Association (SLA) Trending Technology Webinar, Online Presentation. Blockchain: An Investigation of Possible Library Applications. (2019, February). Paper presented at the 2nd International Conference on Changing Landscape of Science & Technology Libraries (CLSTL 2019), Gandhinagar, India, Online Presentation. Blockchain: One Emerging Technology—So Many Applications. (2018, November). Refereed panel presented at the 81st Association for Information Science & Technology Annual Meeting, Vancouver, Canada. Trendsetting at the SJSU iSchool : Blockchain and Information Services. (2018, November). Paper presented at the 2018 California Library Association conference, Santa Clara, CA. Pros and Cons of Blockchain. (2018, October). Paper presented on a panel at Blockchain in Education West conference, Sunnyvale, CA. Blockchain: Recommendations for the Information Professions. (2018, September). Paper presented as a free ALA Webinar, Online. Blockchain – is it worth the fuss? – Flash Session. (2018, August). Paper presented on a panel at the 2018 IFLA conference, Kuala Lumpur, Malaysia. Blockchain Technology. (2018, March). Paper presented on a panel at a webinar for the SLA Philadelphia and Pittsburgh Chapters, Online. Blockchain, Open Civic Data, and TV WhiteSpace – Three New Projects. (2018, February). Paper presented at an invited panel at the 2018 American Library Association Midwinter Conference, Denver, CO.
Dr. Craig John Alimo joined the San Jose State University Office of Diversity, Equity and Inclusion (ODEI) in February to fill a new position as a diversity trainer/educator. He will oversee curriculum and professional development, and conduct outreach efforts for a student population of more than 33,000. He joins SJSU’s Chief Diversity Officer Kathy Wong(Lau), Deputy Diversity Officer Fernanda Perdomo-Arciniegas, and other staff members in the office who are engaged at a university with a storied and long history of student civil rights activism and service to a diverse student population. 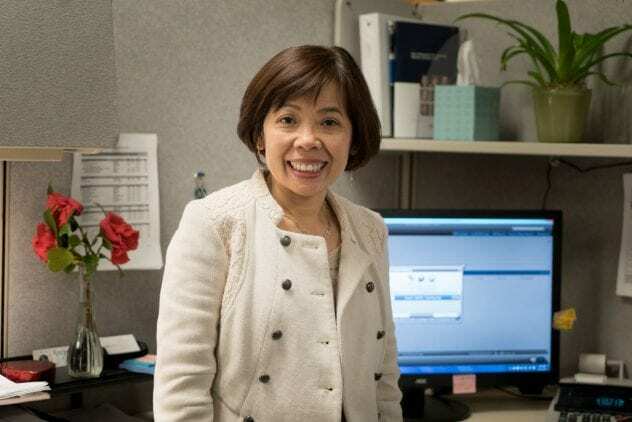 Dr. Kathleen Wong(Lau), SJSU’s Chief Diversity Officer since 2016, said Alimo’s lengthy and extensive experience in educational diversity and familiarity with academia is a strong advantage. 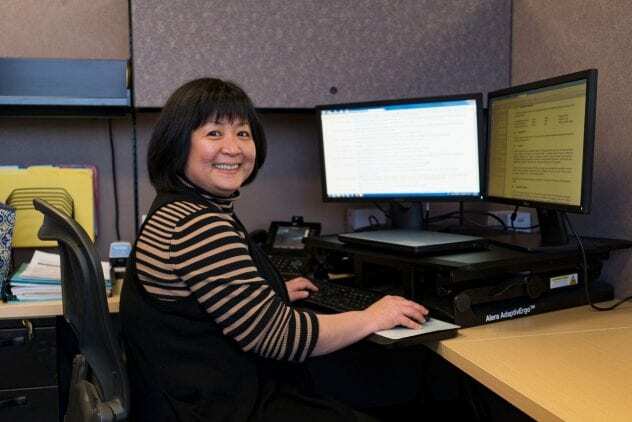 Wong(Lau) said Alimo will be taking over many of the tasks she’s been handling since arriving at SJSU, freeing her to oversee additional comprehensive campus-wide diversity projects. 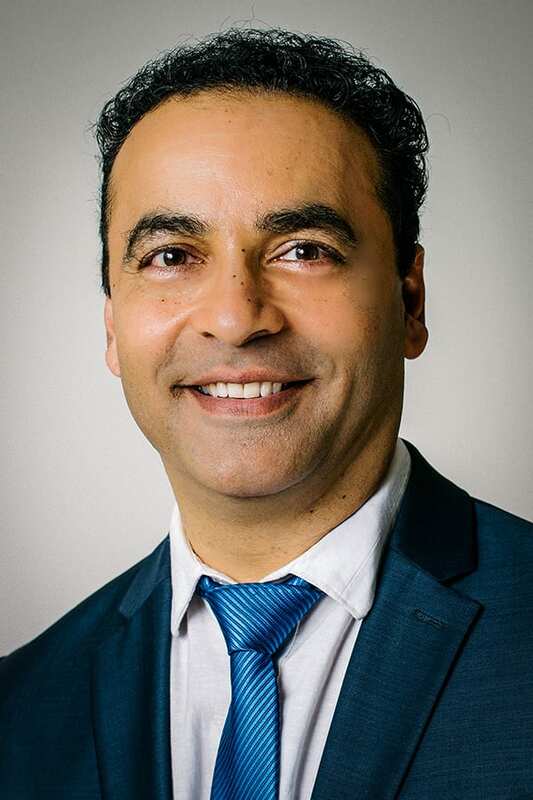 Logging 23 years of work in social justice and diversity education, Alimo most recently worked as director for equity and inclusivity for the Napa Valley Community College District. He also previously worked at the University of California, Berkeley and the University of Maryland, among other educational institutions. “I’m totally tickled, excited and humbled to be working with Kathy,” Alimo said. He and Wong(Lau) worked cooperatively on a nationwide research project examining the educational benefits of Intergroup Dialogue programs, a small-group, face-to-face discussion format that encourages participants of two or more different social identity groups to reach new levels of understanding, relationships and action through talk with an extensive list of reading assignments. Among other duties, Alimo will oversee the university’s intergroup dialogue initiative, started a year ago. The groups of 12 to 15 people each meet weekly over an eight-week period. ODEI initiated the program, helping train faculty, staff and students from across campus who volunteered for training to become group facilitators. This spring, 170 SJSU students, faculty and staff volunteered to participate in these discussions, far outpacing the initial capacity. Diversity “touches all aspects of a university,” Alimo said. Campuses can be places where students from often-segregated communities or circumstances first meet substantial numbers of people from different racial, ethnic, cultural and religious backgrounds as well as sexual orientation and gender identities, he said. Alimo expressed excitement about how intergroup dialogue can foster greater understanding and better relations between and within various groups on campus. The pedagogical approach that Intergroup Dialogue uses to creating an anti-bias, anti-racist, multicultural and social justice educational system has its roots to the 1940s and ‘50s. Its more recent incarnation on university campuses was initially created during the 1980s when the University of Michigan created its Program on Intergroup Relations. Wong(Lau) said SJSU’s program is based on that model. University-based diversity programs can have ripple effects on the rest of society, Alimo noted. He recently attended a presentation by a collection of local high-tech companies addressing the importance of diversity, equity and inclusion initiatives in the workplace and corporate world. Silicon Valley companies on how they can capitalize on the presence of diversity in the workforce up to the executive level. Wong(Lau) expressed excitement that adding Alimo to her team will greatly enhance the work of her office, which she described as having “a good reputation for delivering good work.” Another program of which she’s proud is an eight-week session for white faculty members to recognize how their comparatively privileged status and still-majority position at SJSU can be used to foster greater awareness and understanding for their colleagues and students of color. “One of our biggest challenges is remaining nimble yet helping campus leaders focus on long-term goals of building organizational capacity for diversity, equity, and inclusion,” Wong(Lau) said. “It is a community of 40,000 people and we want to support everyone’s success, engagement, and growth. 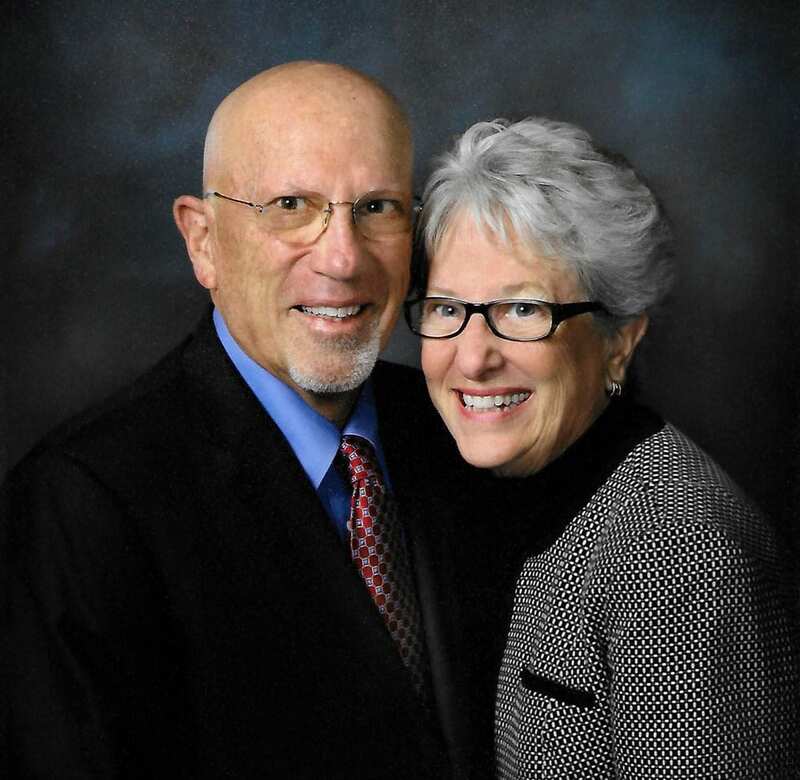 San Jose, Calif. — San Jose State University is pleased to announce that it has received a $1 million gift commitment from Steve and Cheryl Caplan. The gift is the latest commitment in a growing list of seven-figure gifts that will support a new football operations center on the east side of CEFCU Stadium, Home of the Spartans. An additional $1 million from their estate will establish the Caplan Family Faculty Fellowship in the Lucas College and Graduate School of Business, the Caplan Family Teacher Innovation Fund in the Connie L. Lurie College of Education, and a Spartan Athletics Fund Scholarship endowment. The Caplans met at San Jose State and recognize the role that the university plays in the economic well-being of Silicon Valley. They hope this gift will enable SJSU to continue its good work for future generations, help build a stronger foundation for Spartan football and the Department of Intercollegiate Athletics, and inspire friends and fellow alumni to invest in the university. A 1965 graduate of San Jose State’s College of Business, Steve is the retired owner and president of KBM Workspace, an office furniture and design company. He joined the firm when he was a senior at San Jose State and purchased the company in 1984, helping it grow from a local dealership to a large company with business throughout the U.S. and Canada. 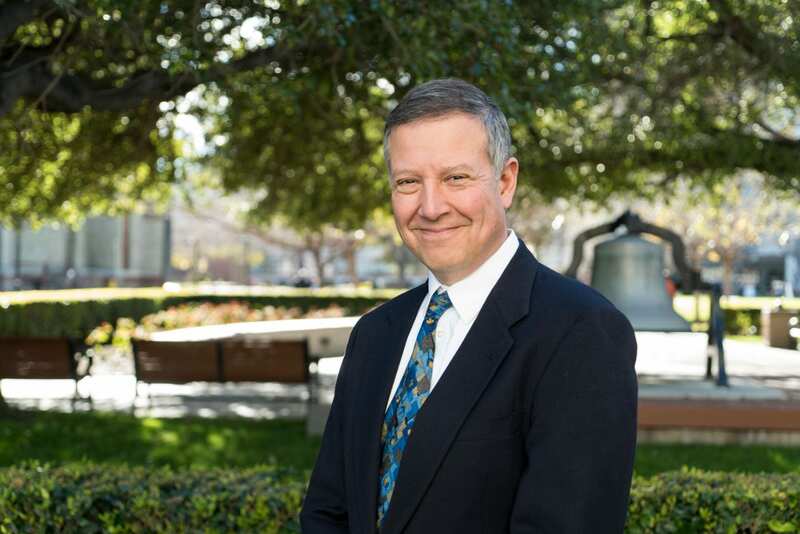 He is a founding board member of the Tower Foundation of SJSU, an auxiliary organization whose sole mission is to serve the philanthropic purposes of San Jose State. Currently serving his third term as a board member, Steve is also an active volunteer, helping alumni discover ways to support athletics, including the development of a new football operations center. Cheryl taught public school after graduating from San Jose State’s College of Education in 1967. The mother of two boys, she served as a volunteer in the rural Loma Prieta School District and worked with the principal and superintendent, researching and implementing curriculum, and creating a preschool testing program that helped parents, teachers and children prepare for kindergarten. She became well-versed in the issues challenging education, including communication between families and schools, adequate funding and teacher preparation. Steve’s goal with Spartan Athletics is to raise awareness and support the funding effort for the renovation of the east side of CEFCU Stadium. The Caplans believe that the future of San Jose State Athletics is very bright, they said, as there is a very cohesive team in place that understands the critical nature of the need for competitive facilities that will put the university on equal footing with others in the conference. The Caplans have been on the boards of service organizations such as the San Jose Hospital, Samaritan Health Systems, The Health Trust, YMCA of Silicon Valley, KTEH/KQED Public Television, Santa Clara County Boy Scouts of America, the San Jose Rotary Club and Tahoe Maritime Museum and Gardens. 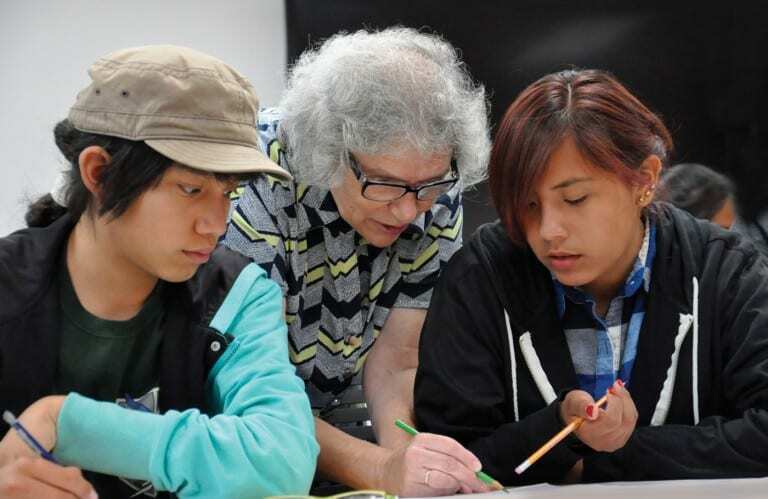 Professor Tatiana Shubin, center, works with students. The next talk in the University Scholar Series is scheduled for March 27, at noon, when award-winning Professor Tatiana Shubin will give a talk on “Moving in Circles: the Beauty and Joy of Mathematics for Everyone.” In 2017, she received the Mary P. Dolciani Award, which recognizes a pure or applied mathematician for making distinguished contributions to the math education of students in the United States or Canada. She is credited with creating the San José Math Circle as a weekly space for middle and high school students to gather to engage in problem-solving work. The University Scholars Series was expanded this spring to include four talks by faculty members who are engaged in world-class research, scholarship or creative activities that connect to San Joes Staté University to hot topic global issues, such as social justice, civic engagement, emerging technology and STEM education. 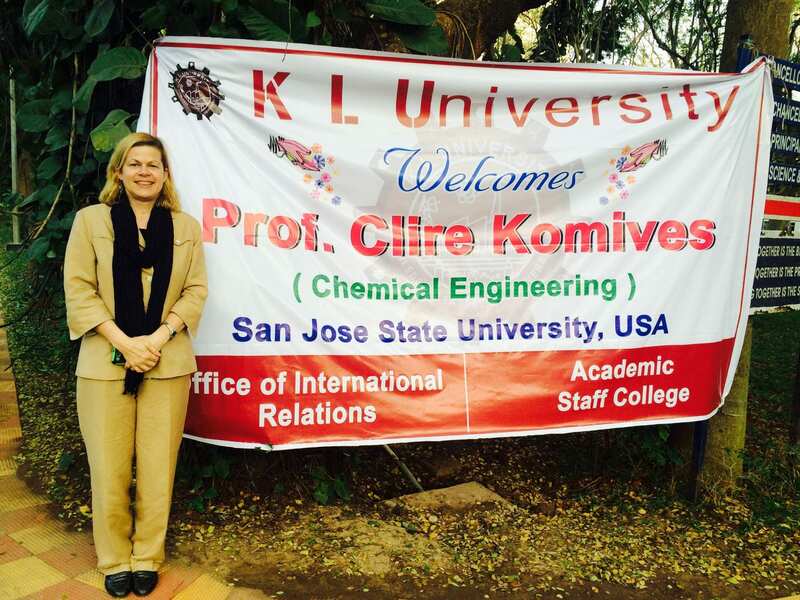 Professor Claire Komives stands in front of a welcome banner at a university in India. 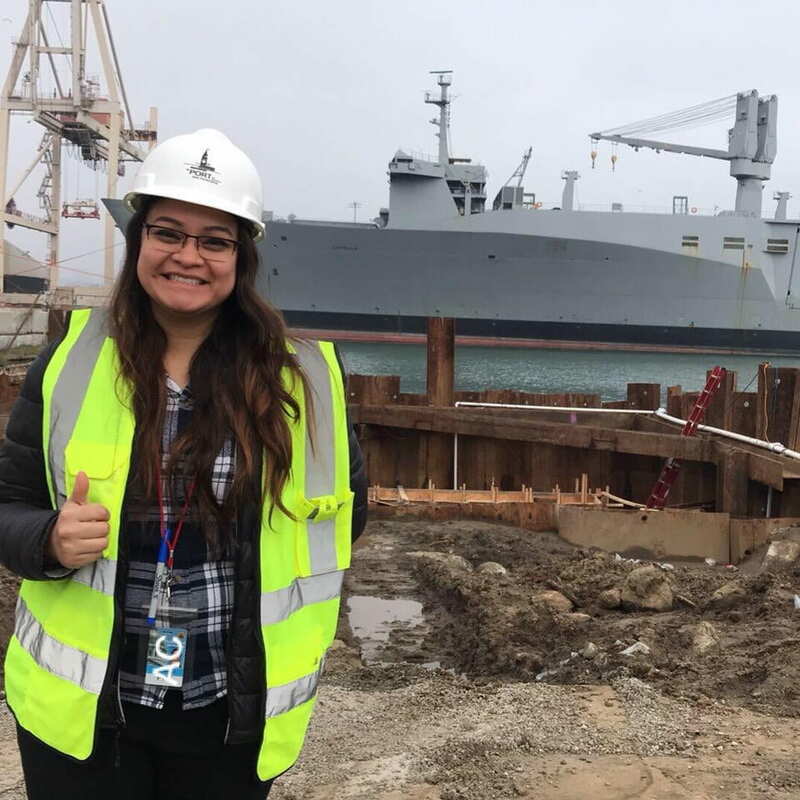 She will again travel to the country as a Fulbright Scholar in fall 2019, when she will visit as many as 75 colleges and universities in hopes of enhancing engineering education. While San Jose State was recently named as a Fulbright top-producing institution for the number of scholars who visit from other universities, SJSU faculty are regularly award Fulbright grants or awards to visit other countries and universities to conduct research and teach. In 2018, Associate Professor of English Cathleen Miller served as the Distinguished Chair of the Humanities at the University of Manchester in the United Kingdom while also studying the phenomenon of women’s migration throughout the world. Humanities Lecturer Victoria Rue visited Dar al-Kalima University in the West Bank to teach and conduct scholarly work. In fall 2019, chemical engineering Professor Claire Komives will travel to India on her second Fulbright Scholar Grant. In 2104-15, she traveled to the Indian Institute of Technology Delhi, where she conducted research on creating a low-cost antivenom solution for developing nations. Now she plans to return with a new focus. “I have proposed to go to India and work with faculty and administrators of engineering colleges to try to improve the quality of teaching,” Komives said, noting that many institutions in India use traditional teaching methods such as lectures and often use outdated curriculum. 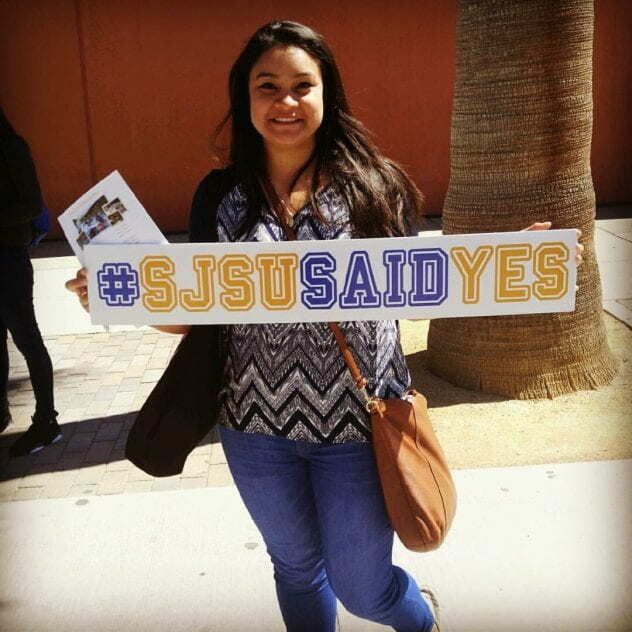 She will be bringing a model of education that has proven successful at San Jose State – active, project-based learning. “I want to try to help them learn about new methods of teaching such as inquiry-based learning,” she said. Claire Komives, in the center by the screen, offers training on using active learning techniques at the end of her last Fulbright Scholar year in 2014-15. Near the end of her first Fulbright experience, she went to an Indo Universal Collaboration for Engineering Education (IUCEE) conference, where she arrived was invited to give one workshop on active learning and she ended up giving eight workshops in different cities all over the country.“I met so many faculty who really want to learn to be better teachers,” she said. From there, she developed an Effective Teaching workshop that became part of a certificate program for faculty. For this next phase of the project, Komives will be based in Mumbai, but will travel to as many as 75 universities and colleges so she can give workshops, engage in peer review of teaching through class visitations and generally sharing how to make class more interactive and effective. Another benefit of her work on enhancing engineering education in India? Ling Yu (Melody) Wen is visiting San Jose State as a Fulbright Scholar as she conducts in-depth interviews with CEOs and top managers in the high-tech industry to explore what skill sets they believe are the most important in creating an innovative atmosphere and corporates’ human capital management. In 2018-19, San Jose State University has been host to three Fulbright Scholars from other countries who are adding to their research portfolio while also teaching courses to Spartan students. The scholars include Ling Yu (Melody) Wen, whose area of expertise is human resources management and corporate training; Lela Mirtshkulava, who is engaged in computer engineering and computer science; and Monika Petraite, who worked on entrepreneurship and entrepreneurial strategies. Their presence has landed SJSU on the Chronicle of Higher Education‘s list of top producers of Fulbright Scholars, master’s institutions. The list is compiled each year with information from the U.S. Department of State’s Bureau of Educational and Cultural Affairs, which runs the nation’s flagship international educational exchange program. Wen specifically selected SJSU for its location in Silicon Valley, its history as the oldest public university on the West Coast and its ranking as the number one provider of employees to high-tech firms in Silicon Valley. Since arriving on campus in September 2018 with a Senior Fulbright Scholar Grant, she has conducted in-depth interviews with CEOs and top managers in the high-tech industry to explore what skill sets they believe are the most important in creating an innovative atmosphere and corporates’ human capital management. Wen also interviewed students, professors and career center staff at SJSU for their input. 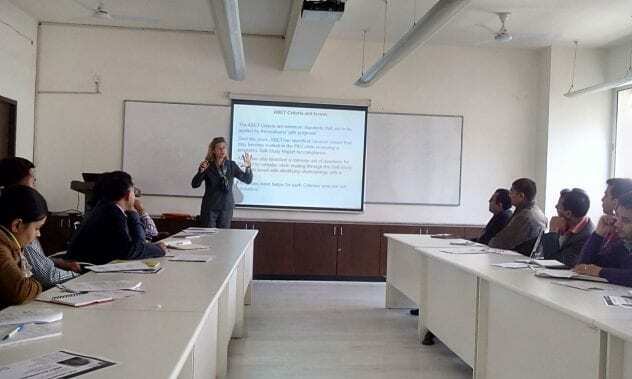 During the Fulbright year, Wen was invited by the Namibia University of Science and Technology and University of Missouri-Columbia as a visiting professor to share the results of the Fulbright research. Wen is a senior professor in the Department of Finance at the National Changhua University of Education in Taiwan and has also served in as a department chair, college dean, dean of International Affairs, and in a variety of administrative roles. She earned her PhD in business education from the University of Missouri, with a focus on human resource management. She has been honored with Teaching Excellence and Service Excellence awards four times during her 24-year tenure in Taiwan, and has been a visiting professor in Germany, Mainland China, Malaysia and Namibia. She was appointed as a distinguished professor at Beijing Forestry University, China since 2015. She also has more than 20-year experiences as a consultant and corporate trainer, as well as the coordinator of National Curriculum and chief judge of National Talent Competitions for High School Students, Ministry of Education, Taiwan. Lela Mirtskhulava was a featured speaker at DataAI National Summit (DANS), Silicon Valley organized by American Association of Precision Medicine and presented the results of the project she has been working since arriving at San Jose State as a Fulbright Scholar. Lela Mirtskhulava experience in the realm of artificial intelligence is unique. She was the first to develop an artificial intelligence capable of diagnosing stroke patients: her prototype artificial intelligence distinguishes between stroke patients and normal subjects with > 99 percent accuracy. She has been honored with the Best Paper Award in 2013 at the University of Cambridge, UK. She was invited as a featured speaker at the AIMed 2017 and AIMed 2018 conferences in Los Angeles. 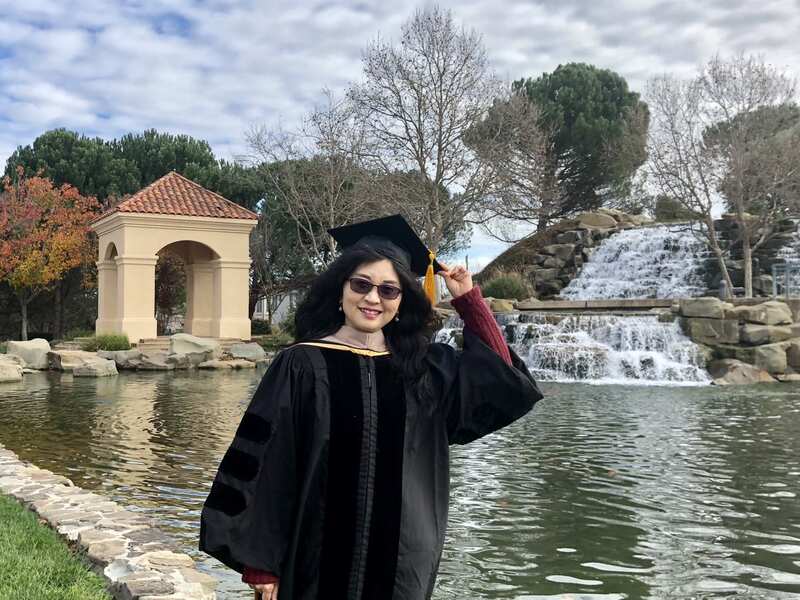 She said at SJSU she has been able to prolong her research and teaching, while her daughter completes a full academic year at a local middle school. Her daughter has been inspired by her teachers while Mirtskhulava is inspiring her own set of students in the two courses she is teaching to postgraduate students; one on deep learning and one on system software. 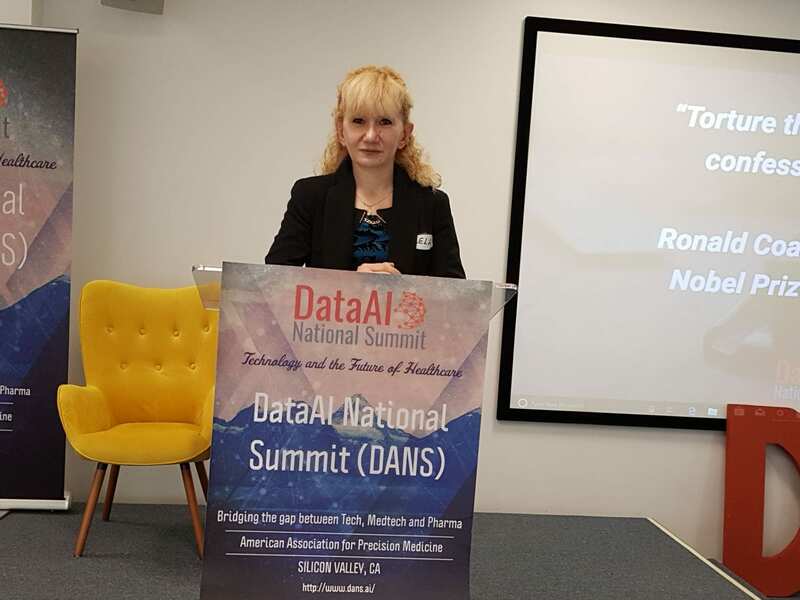 Mirtskhulava was a featured speaker at DataAI National Summit (DANS), Silicon Valley organized by American Association of Precision Medicine and presented the results of the project she is currently working on. The main idea of the project is brainwave monitoring that focuses on neurological monitoring which incorporates the monitoring of brainwaves electroencephalography (EEG). Ischemic stroke occurs as a result of disruption of cerebral blood flow which results in neuronal cell death. Brainwave monitoring over EEG has been a commonly used method in neurological monitoring to diagnose and monitor various neurological diseases such as ischemic stroke. In the given project, Android Neural Network (ANN) is designed and a direct neural interface (DNI) is implemented using NeuroSky’s EEG biosensor for brainwaves recognition. A mobile EEG monitor is connected to a patient’s smartphone over Bluetooth that can transmit real-time brainwave data. Mirtskhulava is an associate professor of computer science at Ivane Javakhishvili Tbilisi State University in the country of Georgia as well as San Diego State University Georgia (a collaborative progam between SDSU and Georgian partner universities that offers select STEM degrees). As a Fulbright Research Scholar, she is teaching part-time in the Charles W. Davidson College of Engineering this year. Mirtskhulava received her PhD in computer science. She has served in various capacities at several Georgian universities and has 15 years of industry work experience as an ICT senior engineer at Ericsson Ltd and Geocell LLC, Georgia. She Mirtskhulava was invited to the University of Cambridge in England to conduct the scientific workshops in 2013. She was the recipient of DAAD Scholarship Certificate in scope of Academic staff exchange program, at Westsaxson University of Applied Sciences Zwickau, Germany in 2016. She has also developed new curriculum in computer engineering and technologies at International Black Sea University, Georgia where she served as program coordinator of bachelor programs in Informatics and as a quality assurance manager at the same university. She participated in new program development in computer science for ABET at Ivane Javakhishvili Tbilisi State University. She is supervising master students and PhD students in Georgia. In light of that, Lurie College of Education faculty David Whitenack and Lisa Simpson recently applied for and were awarded a Teacher Residency Grant through the California Commission on Teacher Credentialing to create opportunities for Lurie College students to complete special education, STEM, and/or bilingual education residency programs. Read more on the Connie L. Lurie College of Education blog.